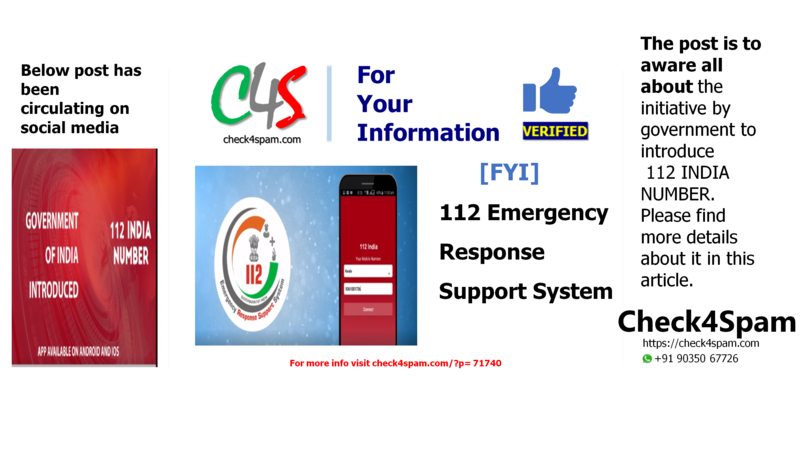 The post is to create awareness about the initiative by government to introduce 112 Emergency number in India. Please find more details about it in this article. Safety has become a big issue nowadays for many of us. For various reasons, children, girls, women and senior citizens stay alone, travel alone. This app is very useful as this allows us to be safe and sound by getting immediate support system in an emergency. This post is to create awareness about the initiative the government has taken for the safety of all so as to make the country a better and safe place to live for all of us. In the video shared, you can see how to install and use this app for your safety. One can also register to be volunteer for this purpose. This helps you to immediately get support system from nearby protection, that is police. The police vehicle reaches within few minutes as they get the GPS location when one uses this app. 1.. Connected to single emergency response number across the country. 2.. Provides 24 hours and 7 days access to efficient and effective response system. 3.. Can receive inputs from various voice and data services such as voice call, sms, email, Internet of things , panic buttons in public transports. 4.. Automatic identification of incident location and rescue vehicle. 5.. Concurrent dispatch of distress signals to ERC and kith and kin. In case of emergency you just have to press this number and you can be saved from the upcoming danger. This is very useful for the kids, girls and women and senior citizens, who travel alone due to different reasons. Though it is a responsibility of each one of us to make this universe to be safe for all, still we have few mischievous people, because of them, lot of problems are created for many of us. The victim can be a child, a girl, women, senior citizen or man. Using this facility provided by government, this issue of security can be solved to large extent and people can be safe at any place any time. Watch the video carefully and share this post with all your friends and family so that more number of people can make use of this app and can be safe, wherever they are. Share the good news. Make more and more people aware about it. Volunteer for this to save others. Let us make all live peacefully and happily without any fear. Request to all the people who feel that they require protection due to their working hours or the students who go for tuition at odd hours and all the old people who stay alone to install this app to be safe. Be careful, be aware, be safe.